After passing through local villages and rice fields, we knew we had arrived in Ubud from it’s tourist filled streets, abundance of vegan restaurants and yoga studios. Our driver took us to a remote parking lot halfway up a very narrow side street lined with vendors selling Balinese souvenirs. Three staff members met us on motorbikes and drove us and our luggage - yes on motorbikes, they’re balancing pros don’t worry - to our home for the next three nights; Solo Villas Ubud. Our expectations were exceeded the moment we stepped on to the property. 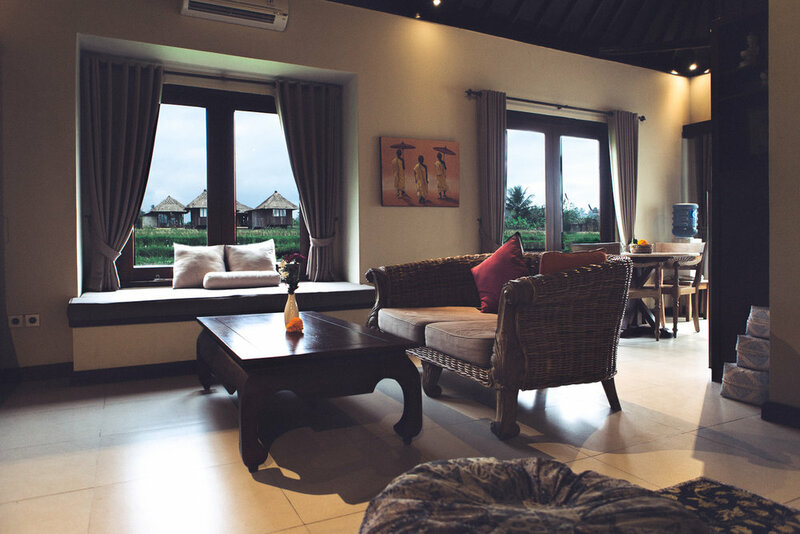 Not only is Solo Villas smack in the middle of a beautiful rice field, it’s incorporation of Hindu traditions and surrounding nature in the open courtyard greets you and is immediately zen inducing. We walked into our suite and immediately saw green rice fields, blue skies, and adorable ducks right outside our windows. I haven’t seen any place that gets you as close to the rice fields as Solo Villas does, I mean you could reach out your window and plant your own rice if you knew how, of course. From that moment and for the rest of our stay we didn’t want to leave our room. The property is in a secluded part of Ubud where locals outnumber tourists and everyday life goes on just as it did before any tourist arrived. If you need to go to town for any reason, it’s just a 20 minute walk from the property; a very scenic walk where 20 minutes feels like 10. If your plan is to avoid the busy streets of Ubud center, there are plenty of warungs (family-run restaurants) nearby. You could easily spend hours walking through rice fields and the local farmers are happy to talk to you. We stayed in the Deluxe King Suite although, every room has a view of the rice fields just as good as ours did. Whether we were in our comfy king bed, sitting in the spacious living room while watching one of the many DVD movies provided or sitting at the kitchen table working on our laptops, the view never got old. In the mornings we would wake and walk through the lush courtyard to our breakfast with options like pancakes, cheese and veggie omelet, nasi goreng (fried rice with egg), muesli with yogurt, toast, bagel, banana bread, fruit, fresh juices, coffee and more. The staff, who are all from the local village, were so sweet and always attentive. Anytime we wanted a ride to or from Ubud center, they were happy to accommodate us. They provide tour bookings and laundry services on site, too. We couldn’t have asked for a better introduction to all the things Ubud is known for stunning landscapes, friendly locals, authentic food and ultimate relaxation. 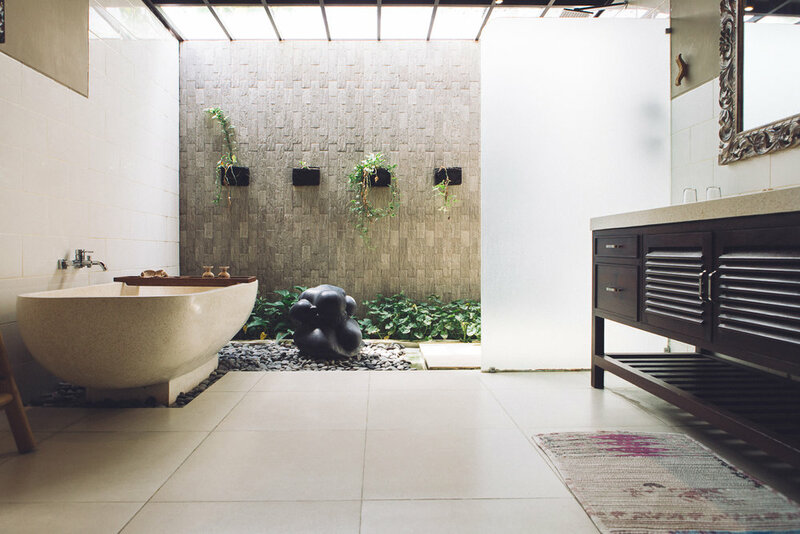 Solo Villas is the place to be in Ubud to get the best of both worlds; the city center and local sights or rest, relaxation, and local culture. Whatever your plan is, you’ll be happy to return to your suite each night. Say hello to Cooper for us!